Examination of Charles Furneaux’s portrait of Frederic Kidder revealed a variety of problems. 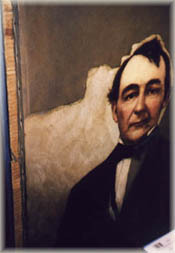 Mildew growth within the fiber of the canvas had blanched regions of the portrait. The painting’s surface was also scratched, discolored, and darkened by an old coating of linseed oil (seen on right). 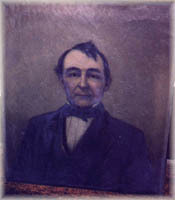 Mr. Blankenship first stabilized the surface of the painting to prevent additional cracking and then went to work on the mildew infestation. He chemically treated the fibers of the canvas to irradicate the mildew spores. 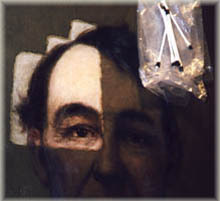 With the mildew gone, he began cleaning and retouching the painting (seen below). Additional care was required to eliminate and reduce the dark stains and spotting the mildew had caused.